B&H Photo provided Photofocus the Pelican MPD40 40L Duffel bag in return for a review. I was one of the first authors to volunteer — thinking it was a camera backpack. Imagine my surprise when I learned it was, well, er… a backpack. My views changed after a visit from my cousin Mary Ann. Here are my thoughts on how a photographer can use this backpack to travel light and have their camera gear too. As I mentioned to my cousin Mary Ann — who happen to stop by to borrow a camera bag for her overseas trip — changed my opinion on using the Pelican backpack. She saw an image of the Pelican bag — it hadn’t arrived yet— and said, “That’s exactly what I need for my trip!” She proceeded to tell me why, so I thought I would give it a try on my trip to Seattle. My use for the Pelican bag was different than my cousin’s. She had serious restrictions on size, weight and the number of bags she could bring. 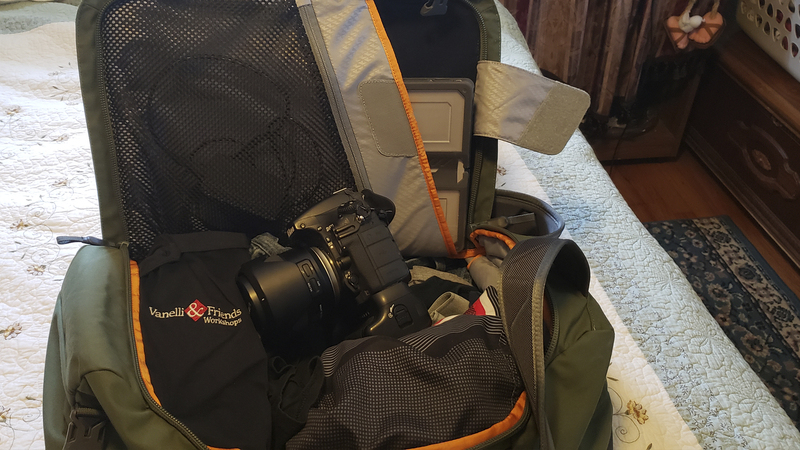 I just wanted to test it to see if I could consolidate my camera gear, Surface Pro computer, some video gear and clothes into one bag, then — when I arrived in Seattle — take out the clothes and use the bag to transport my gear. Mary Ann was excited to see that when the bag was used as a backpack, the zippers were in the back — keeping her valuables safe from pickpockets — a concern I had never thought of. We both needed a large bag to carry our clothes and camera gear plus a few extras we needed. I was really happy the bag has a protective laptop pocket. It’s designed to hold up to a 17″ laptop. It had no problem holding my smaller Surface Pro computer and iPad together. Zippers are on the back to protect against thieves. The large main compartment can hold books, clothing, shoes and other bulky gear. Interior organization pockets provide tidy storage for toiletries and valuables. The protective laptop pocket is designed to hold up to a 17″ laptop. Carry using the compression molded convertible shoulder straps or the padded carry handles. Made of 1000D nylon with a water-resistant outer shell. Impact-resistant ballistic nylon coated EVA bottom corners provide added durability. The Pelican bag is not designed as a camera bag. There isn’t extra padding or compartments designed specifically for cameras. I used my clothes to keep my camera gear safe and when I removed them in Seattle, I rolled up hotel towels and placed them around my gear to keep everything in place. After the trip, I realized I should have detached the lens from the camera for extra safety in case I dropped the bag. Although my experience was positive, I prefer to use my Think Tank roller bag for camera gear and my Think Tank My 2nd Brain Briefcase for my computer and accessories when I don’t have to worry about restrictions. With that said, I’ve used the Pelican 40L bag many times as a weekend travel bag since my Seattle trip. I like the fact I can pack my clothes and carry extra video gear that doesn’t fit in my camera bag. I can see the need for this bag on an overseas trip when I want to travel light and keep my camera gear with me.